We came into the La Crescent Wine and Spirits Spring Creek National with the thought that two of the region's local heros, Jeremy Martin and Ryan Dungey, stood a good chance of making significant strides in their respective championship hunts by stacking more points than their closest title threats. And while both Martin and Dungey left Spring Creek in better shape than they arrived, it didn't exactly unfold in the dominant fashion we thought it might. Check out the today's Race Day Feed for the details. If you were on Twitter during this moto you probably saw the moto community going nuts. For good reason too, as Eli Tomac and Ken Roczen put on a spectacular battle in the first moto of the day. But before that happened Ryan Dungey kicked the whole thing off with a holeshot, only to see Rozcen blast by him in the sand whoops almost right away. It wasn’t long before Tomac followed suite and went after Roczen. What followed was amazing, with the two going at it for what seemed like forever. There were several side-by-side moments, and Roczen even went back around Tomac the first time Tomac took the lead, but when Tomac took the lead for good he did it with authority and it wasn’t long before he’d completely checked out. Want an amazing number? 24.969. 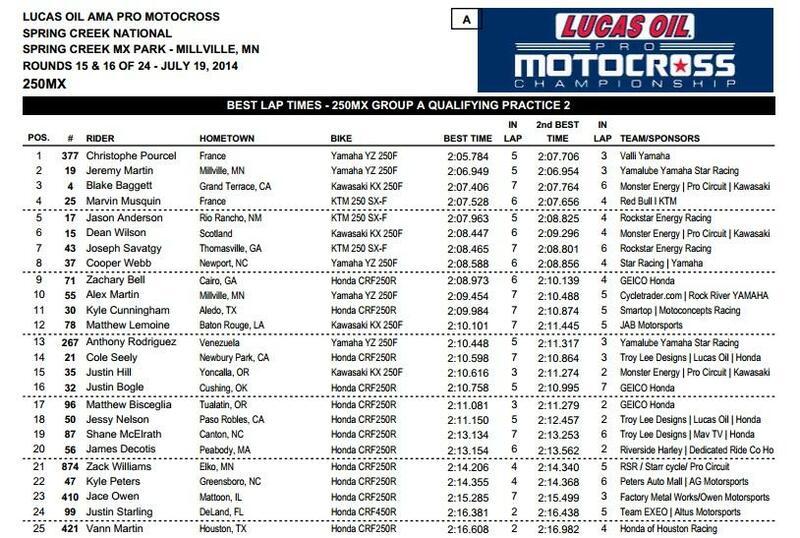 That’s how many seconds Tomac beat Dungey, last week’s winner, by. Elsewhere James Stewart had a mishap early and dropped outside the top fifteen. By the checkers he was able to charge back up to seventh. Josh Grant had another solid moto with a fifth, and he had to go through Brett Metcalfe to get it. Eli Tomac holeshot the second 450 Moto but the pack was quickly recalled to the start via red flag, due to a malfunction with the gate. No worries in the Tomac camp though, as the GEICO Honda rider nabbed another holeshot. He briefly gave the lead up to Justin Brayton but it didn't take long for him to get it back. Ryan Dungey did his best to keep him honest, and at one point even closed up nearly to his rear wheel, but Tomac opened it back up and checked out to go 1-1. Roczen attempted to join the battle but just couldn’t match the pace up front and faded back, eventually falling victim to Trey Canard. Roczen finished the moto in fourth ahead of Josh Grant, who went 5-5 on the day. James Stewart started the first time but was credited with a DNS in the second moto when he didn’t line up for the restart. Initial reports have him suffering from dizziness. The action started with a Christophe Pourcel Holeshot, with Justin Bogle and Jeremy Martin in tow. Bogle bobbled early handing second to Martin, and it wasn’t long before Martin snatched the lead from Pourcel. But Pourcel stayed relatively close to Martin for a while before dropping back a bit and falling victim to Marvin Musquin in the sand whoops, who’d just finished putting the moves on Dean Wilson. Speaking of Wilson, he had a podium ride going but just wasn’t able to hold off Musquin, and in the closing laps of the race, his teammate Blake Baggett, who was charging after a lousy start. Cooper Webb had a good ride going too but went down after getting together with Justin Bogle. Both Kyle Cunningham and Jason Anderson were involved in a first-turn pileup and both started way back. Credit to them for charging back up into the points. Anderson finished in eleventh, while Cunningham took twentieth. We saw Justin Hill exit the track early in this one. Turns out his elbow injury flaired up and he couldn't hold on. At this point he's unsure if he'll be back for Washougal. Christophe Pourcel ripped a big holeshot to kick the second moto off, followed by Alex Martin and Blake Baggett, who had gotten a rare good start. The #4 of Baggett would soon move into second and pressure Pourcel, who didn’t put up much of a fight. Baggett took the lead, only to go down all by himself shortly after and lose a ton of spots. Baggett got back in it but was slow to recover, and his day went from bad to worse when his bike quit. He tried to bump start it down Mount Martin but it wouldn’t fire. He ended with a DNF. Speaking of DNFs, Justin Bogle pulled one of his own. The GEICO Honda rider was running well early but started going backward in the second half of the moto. He capped it off by going down hard. The good news is that he's fine and will be back in action next week at Washougal. 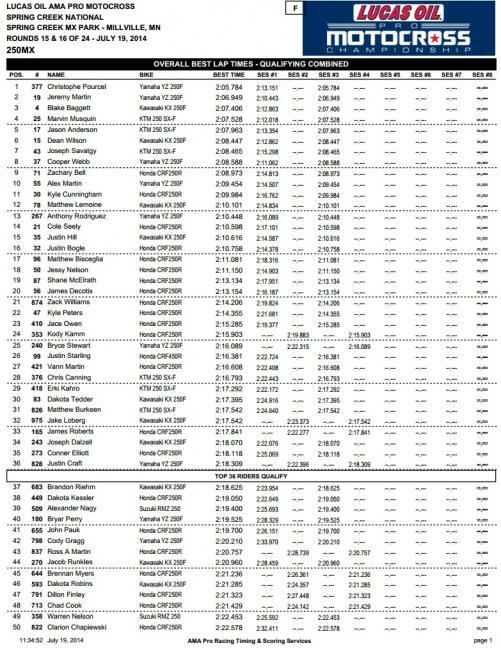 The best rider in this moto was Cooper Webb, who battled Bogle hard to take the lead on lap seven. J. Martin eventually worked into second and started slowly chipping away at Webb’s lead, but Webb held strong to take the moto win. For Jeremy Martin, who literally grew up on the property, a 1-1 today could very well put this championship on ice. With a 27-point lead over Blake Baggett, a perfect day for Martin combined, with consistent podiums for the rest of the season, would be a deadly combination. Then there’s the other hometown hero, Ryan Dungey. He trails Red Bull KTM teammate Ken Roczen by 26 points and hasn’t been able to put up much of a resistance to Roczen’s charge in the first half the season. But he took the overall last weekend, and his home track would be a great opportunity to get another win and start chipping away at Roczen’s championship lead. But if Dungey gives up even more points today, it’s going to be tough to get back in it as the season enters its final rounds. The second practice sessions have come to a close and as expected, times have dropped drastically (roughly 5-6 seconds) on a broken in, and more importantly, much drier track. Despite the changing conditions however, Roczen remained on top of qualifying, although Dungey was able to come in much closer this time around. Making a return to racing is Tommy Hahn, who qualified 25th overall. 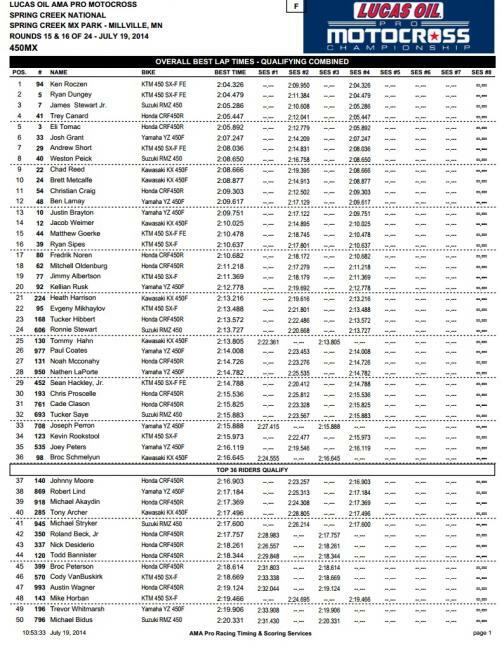 In 250 action about the only surprise was that Valli Motorsports Yamaha's Christophe Pourcel didn't set the fastest lap time of qualifying on the final lap of the final session. He set it on the fifth lap of the final session, and was over a second faster than Jeremy Martin in second. 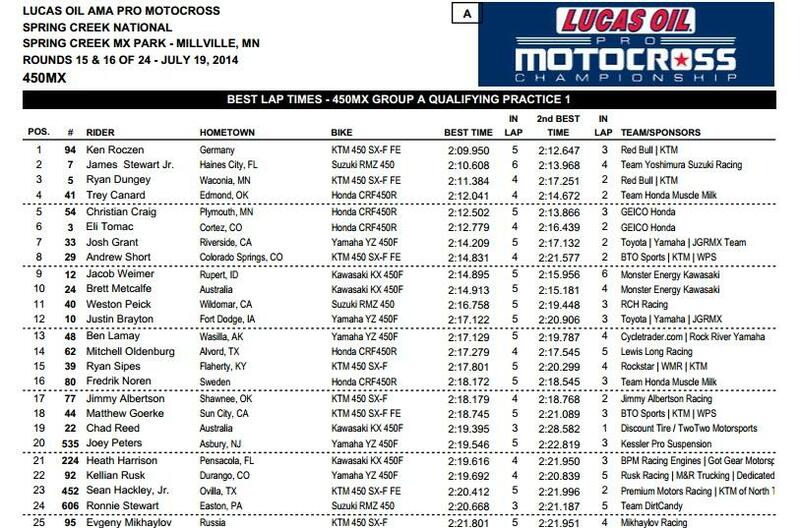 The first practices are over here at Spring Creek and shocker, Jeremy Martin was fastest in the 250 Class. Not surprisingly, his brother Alex was also fast, turning in the ninth-fastest lap. In 450 action the best lap that local boy Ryan Dungey put together was only good for third-fastest behind Ken Roczen and James Stewart. The track was pretty sloppy for these first sessions though, so don’t be surprised if the times change radically for the second practice when things are a bit drier. The track has undergone a few changes, most notably the addition of an uphill section that takes riders up a huge, extremely steep hill that left this reporter drenched in sweat after struggling to walk (sometimes resorting to all fours) up it yesterday afternoon. It’s so steep that wooden stairs had to be added near the top just so spectators could make it all the way up. After hitting the top the course immediately turns 180 degrees and drops back down to its lowest point in a hurry too, taking riders straight down an elevator-shaft-like section that is going to get very whooped out. Speaking of whoops, you’ve probably heard of the infamous sand whoops here at Spring Creek. They look big on TV, but they’re massive in person. How big? If you stood at the correct angle you could almost see kids on 50s popping in and out of view as they went through them in yesterday afternoon’s amateur races. Throw in great dirt, perfect weather, a right-hand start, a pack of the world’s fastest riders and some great storylines and we’ve got a great day of racing ahead of us.